Each cluster of animals will stay up as long it is in good condition and funding for maintenance allows. Our favorite style of yarn bomb begins by asking: how can we transform this object into something else with a yarn bomb? Usually we land on a playful transformation of the physical world. 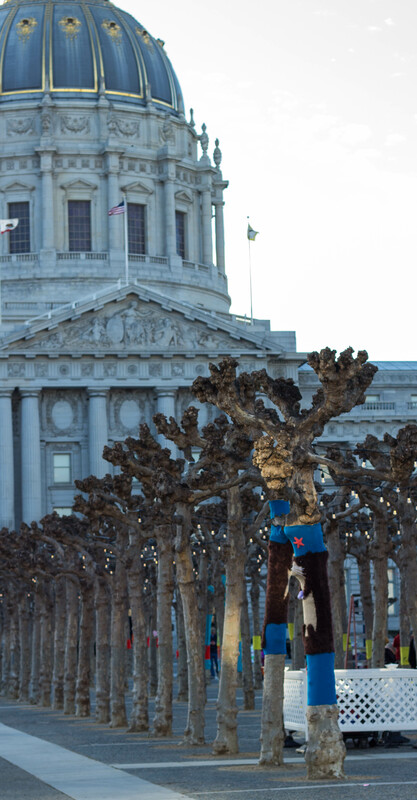 This is exactly the kind of art that inspires us personally when we see it, so we aim to gift it to passersby. 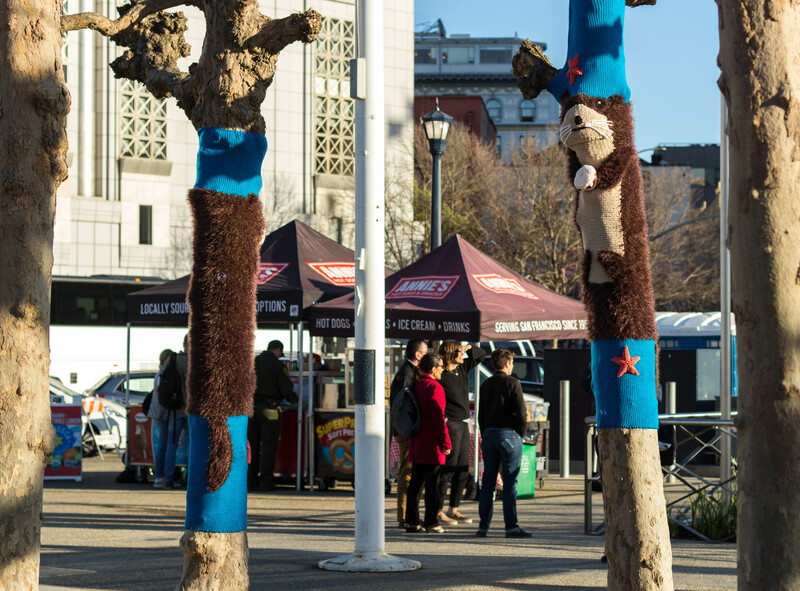 Knitting the Commons keeps challenging us to transform straight tree trunks into colorful, engaging creatures. It’s getting harder, but we still have a few tricks up our sleeves! 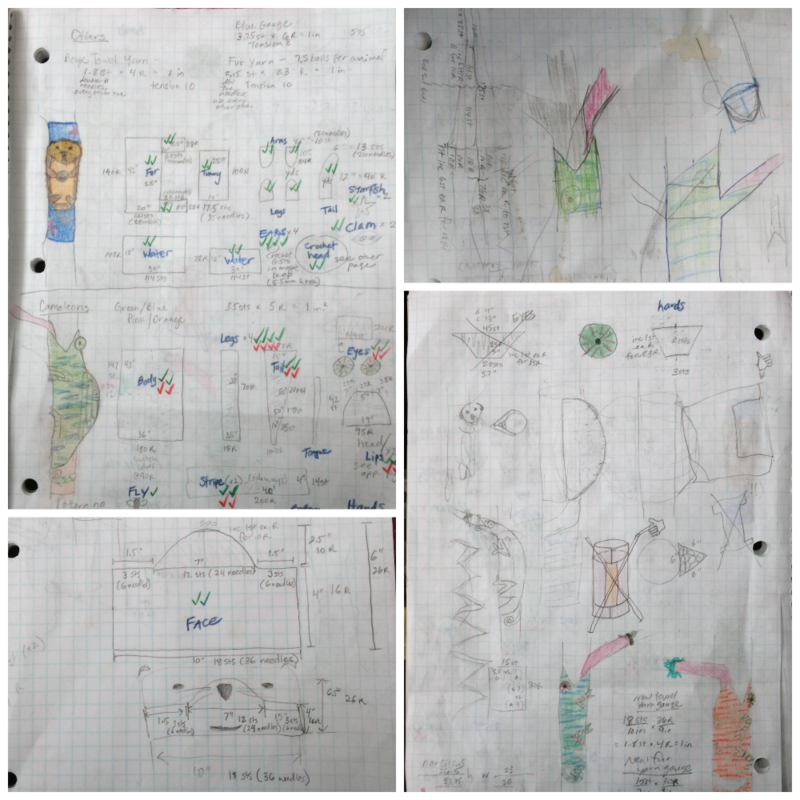 Next we engineer the knitting and crochet to bring our idea to life. Much as knitwear designers engineer a new garment for production, we generate swatches and measurements that let us essentially tailor a custom yarn bomb for an object. Good old fashioned pencil and paper sketches suit us best as we sketch out alternate layouts and and break them down into panels. Convincing details bring a character to life, and adding them is one of our favorite steps. 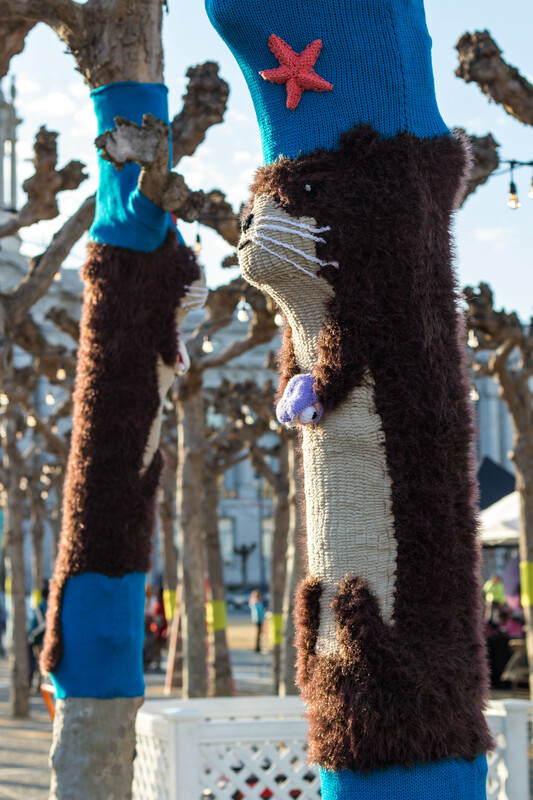 The otters not only got faux fur, but sparkly whiskers and tasty snacks like clams and starfish. Check out the Ravelry project page for more about the yarn, craft, and patterns we used. 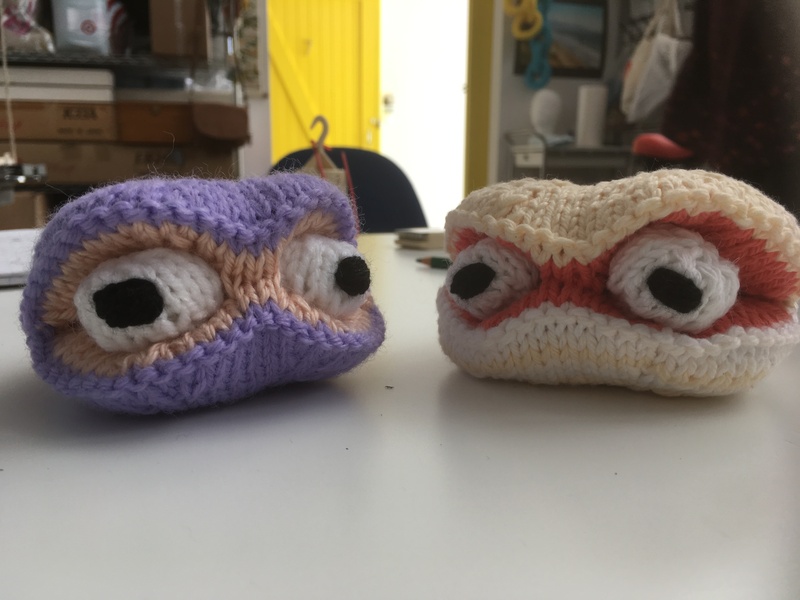 Although when people stumble upon our work they like to imagine little old ladies knitting around the tree, in reality we’re middle-aged ladies who construct and assemble everything into as few pieces as possible from the ease of our art studio. For this project, we tried a new, efficient technique and put all the details and extremities on a background panel. On site, we then hand stitch one invisible seam (known by knitters as a mattress or top stitch). It really is like zipping a cardigan onto the tree! A few light-duty staples on top and bottom hold everything in place. 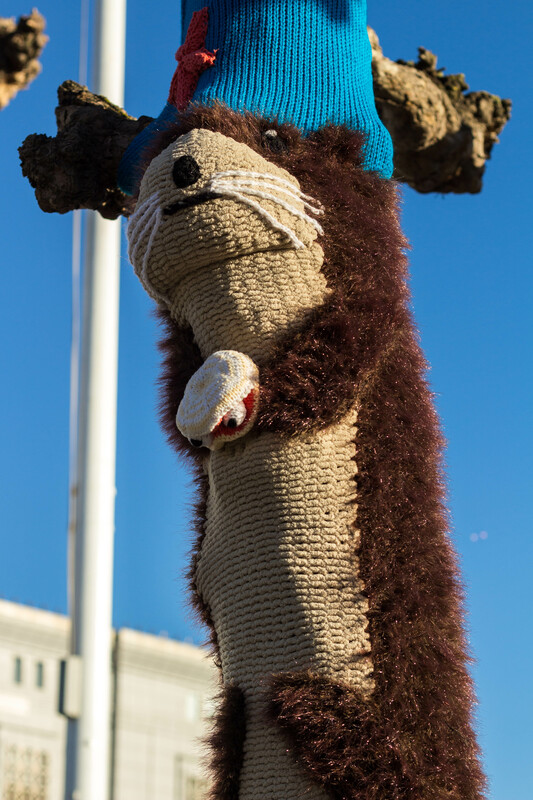 These are removed along with the yarn bomb in time. Maintenance is something we take pretty seriously due to the tactile, delicate nature of putting fiber in public. We monitor our works and make repairs as needed. After one month the otters had just one loose thread! Even more surprisingly, despite direct sun and weeks of rain, the fur still looks like new! 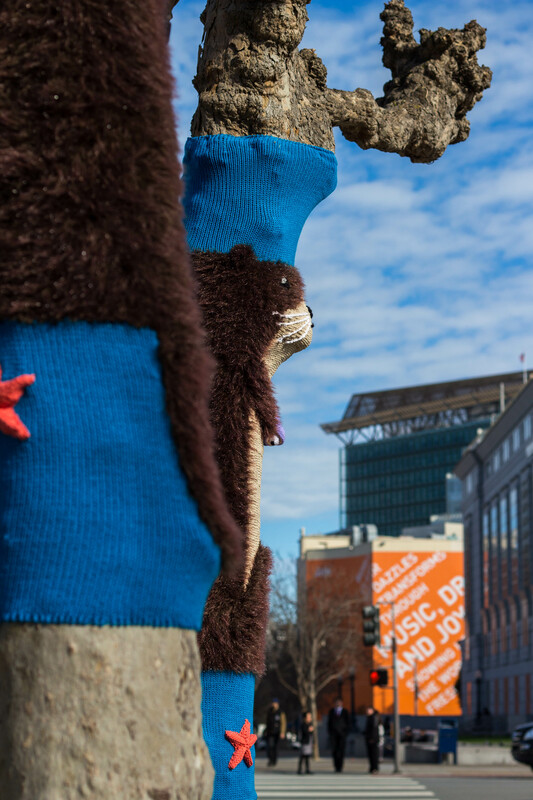 Help us keep an eye on them by visiting them in person and tagging them #knittingthecommons @knitsforlife.